Ferroelectricity and ferromagnetism are two different things, but they are analogous. Materials are ferroelectric if they have a spontaneous electric polarization that can be changed or reversed by the application of an external electric field. Ferromagnetism, in contrast, refers to materials which exhibit a permanent magnetic moment. The materials are very different. In fact, most ferroelectric materials do not contain any iron and, hence, the ferro in the term is somewhat misleading. Ferroelectric materials are a special class of crystals, like barium or lead titanate (BaTiO3 or PbTiO3). Lead zirconate titanate (LZT) is another example. These materials are also piezoelectric: when applying some mechanical stress, they will generate some voltage. In fact, the process goes both ways: when applying some voltage to them, it will also create mechanical deformation, as illustrated below (credit for this illustration goes to Wikipedia). In short, ferromagnetism was discovered and known much before ferroelectricity was discovered and studied, but it’s actually more complicated, because it’s a quantum-mechanical thing really, unlike ferroelectricity, which we’ll discuss now. Before we start, let me note that, in many ways, this post is a continuation of the presentation on dielectrics, which I referred to above already, so you may want to check that discussion in that post I referred to if you have trouble following the arguments below. Let me first remind you of the basics. 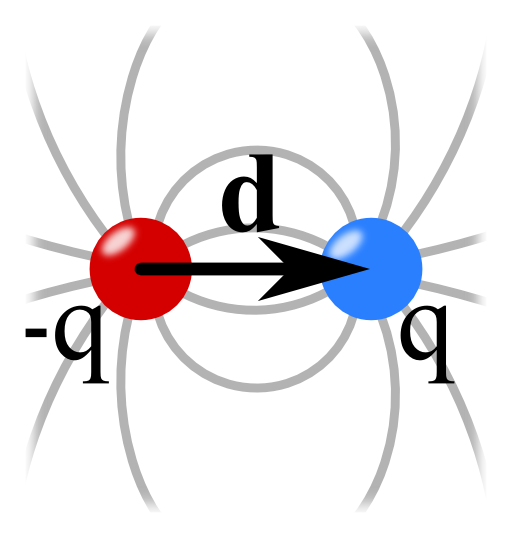 The (electric) dipole moment is the product of the distance between two equal but opposite charges q+ and q−. Usually, it’s written as a vector so as to also keep track of its direction and use it in vector equations, so we write p = qd, with d the vector going from the negative to the positive charge, as shown below. Now, molecules like water molecules have a permanent dipole moment, as illustrated below. It’s because the center of ‘gravity’ of the positive and negative charges do not coincide, so that’s what makes the H2O molecule polar, as opposed to the O2 molecule, which is non-polar. Now, if we place polar molecules in some electric field, we’d expect them to line up, to some extent at least, as shown below (the second illustration has more dipoles pointing vaguely north). This doesn’t say anything new: it just states the dependence of χ on the temperature. Now, you can imagine this linear relationship has been verified experimentally. As it turns out, it’s sort of valid, but it is not as straightforward as you might imagine. There’s a nice post on this on the University of Cambridge’s Materials Science site. But this blog is about physics, not about materials science, so let’s move on. The only thing I should add to this section is a remark on the energy of dipoles. You know charges in a field have energy, potential energy. You can look up the detail behind the formulas in one of my other posts on electromagnetism, so I’ll just remind you of them: the energy of a charge is, quite simply, the product of the charge (q) and the electric potential (Φ) at the location of the charge. Why? Well… The potential is the amount of work we’d do when bringing the unit charge there from some other (reference) point where Φ = 0. In short, the energy of the positive charge is q·Φ(1) and the energy of the negative charge is −q·Φ(2), with 1 and 2 denoting their respective location, as illustrated below. Another example (i.e. other than wax) of an electret is the crystal lattice below. As you can see, all the dipoles are pointing in the same direction even with no applied electric field. Many crystals have such polarization but, again, we do not normally notice it because the external fields are discharged, just as for the electrets. Out of all crystals, some will be piezoelectric. Among all piezoelectric crystals, some will also be pyroelectric. Among the pyroelectric crystals, we can find some ferroelectric crystals. Because this is a blog, not a physics handbook, I’ll refer you to Feynman and/or the Wikipedia article on ferroelectricity for an explanation of the mechanism. Indeed, the objective of this post is to explain what it is, and so I don’t want to go off into the weeds. The two diagrams below, which I took from the mentioned Wikipedia article, illustrate the difference between your average dielectric material as opposed to a ferroelectric material. The first diagram shows you the linear relationship between P and E we discussed above: if we reverse the field, so E becomes negative, then the polarization will be reversed as well, but gradually, as shown below. This entry was posted in Physics and tagged electrets, energy of a dipole, ferroelectricity, ferromagnetism. Bookmark the permalink.